NDTV is known to be severely biased towards the Gandhi family. We have often seen the channel and its anchors batting for the Dynasty, whether that was Sonia Gandhi or Rahul Gandhi. In fact, after yesterday’s No-Confidence motion debacle too, some NDTV journalists found a reason to cheer for Rahul Gandhi. However, there were some for whom the debacle turned out to be too much to handle. Yesterday, Rahul Gandhi made tall claims about an alleged scam in the Rafale deal which was signed between the Modi government and the French government. He asserted that in a ‘private conversation’ between him and French President Macron, Macron had admitted to him that there was no confidentiality clause in the agreement, and thus, the Modi government was lying. It turns out, that Rahul Gandhi was indeed lying as the French government soon issued a statement debunking Rahul’s claims. 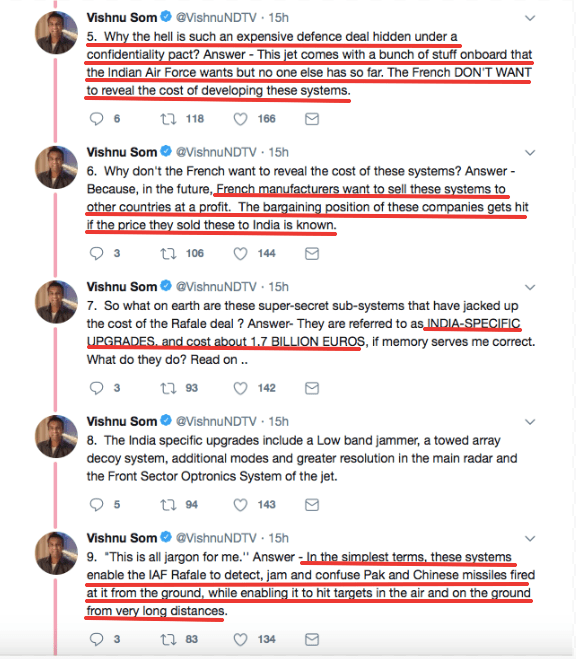 NDTV journalist Vishnu Som too took to Twitter to question Rahul’s badly thought of allegations casting aspersions on the Rafale deal. He tweeted, that the Rafale deal was a “scam” because the government was not being able to point out effectively why the deal was not a scam. On the pricing of the jets, Som pointed out that the Rafale jets that the Congress government had signed up for were not the same jets that the Modi government has signed up for. 3. Without repeating much of what @Iyervval has written, let me try and make a few basic points. Firstly, The Rafales the UPA wanted and could NEVER contract are NOT the same Rafales that the Indian Air Force are now going to get. He further explained with an example. He said that if the UPA government was negotiating for a Maruti Suzuki Swift LXi, the Modi government contracted for a Maruti Suzuki Swift ZXi. Basically saying that the Modi government bought far superior jets with added features that made it more expensive. 4. Lets make it even simpler – If the UPA was negotiating for a Maruti Suzuki Swift LXi, this government has contracted for a Maruti Suzuki Swift ZXi. The latter comes with several more features. This makes it more expensive. He then went on to explain why the confidentiality clause was essential and what were the additional featured that these Rafale jets have, because of which the price of the jets was more than what the UPA had settled for. Vishnu Som explained that the Rafale jets that have been bought by the Modi government have a bunch of featured that the Indian Air Force wants and that nobody else in the world has. The confidentiality clause is essential because the French don’t want to reveal the cost of developing these systems also because in the future, they want to sell these systems to other countries at a profit and revealing the cost and how much India bought the jets for, would take away the bargaining capacity that now rests with the French. As an approximation, Vishnu Som says that the India Specific Upgrades cost about 1.7 Billion Euros and the upgrades are basically ones that would enable the Indian Air Force to detect, jam and confuse Pakistan and Chinese missiles fired at it from the ground, while enabling it to hit targets in the air and on the ground for a very long distance. He ended his explanation by saying that the Rafales being bought by India are actually far more advanced than what France itself uses and hence, the added costs are worth it. 10. Is this stuff all really worth it? Answer – The Rafale, as configured for India, is more advanced than what the French Air Force operates and is pretty much the gold standard for an aircraft of its size and class. Vishnu had also quoted a detailed article by analyst Abhijit Iyer Mitra that explains just why these Rafales are a far better deal than what the UPA has bargained for and why there is really no ‘scam’ as Rahul Gandhi alleges. As for the allegations hurled by Rahul Gandhi, the BJP has declared that they are working on moving a privilege motion against Rahul.